The umbrella term juvenile idiopathic arthritis (JIA) encompasses a heterogeneous group of chronic arthritides that share the following features: (1) disease onset before 16 years of age and (2) a minimum duration of 6 weeks. It is the most common rheumatic entity of childhood, consisting of an autoimmune inflammatory disease of unknown etiology whose main target tissue is the synovium. The knee is the most common site of involvement, followed by the ankle, wrist, and hand. Even though the diagnosis is essentially a clinical one, recent therapeutic advances have drastically changed the role of imaging in its management, given that children with JIA must be diagnosed as soon as possible for timely introduction of treatment (“window of opportunity”). Early recognition and rapid attaining of disease remission are crucial for a benign course and improved long-term outcome. Overall, magnetic resonance imaging and ultrasonography are especially useful for early diagnosis and monitoring of patients with JIA, allowing prompt demonstration of abnormal findings, evaluation of disease progression, and accurate assessment of treatment response. Nevertheless, one should have in mind that widespread use of advanced imaging studies in patients with JIA is still relatively recent and interpretation is hampered by gaps in knowledge and lack of standardization regarding the normal appearance of the growing skeleton; therefore, differentiation between normal findings and pathologic changes can be challenging, particularly in early disease. The following topics in this chapter cover the imaging findings of peripheral joint disease in JIA. Juvenile spondyloarthritis is discussed in Chap. 4, while spinal involvement in JIA is part of the subject matter of Chap. 12. 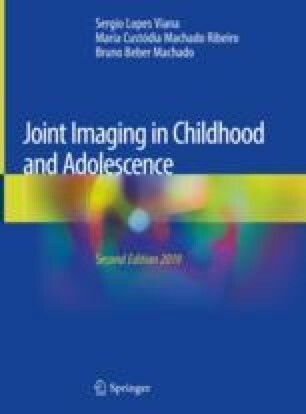 Lanni S, Martini A, Malattia C. Heading toward a modern imaging approach in juvenile idiopathic arthritis. Curr Rheumatol Rep. 2014. https://doi.org/10.1007/s11926-014-0416-9.